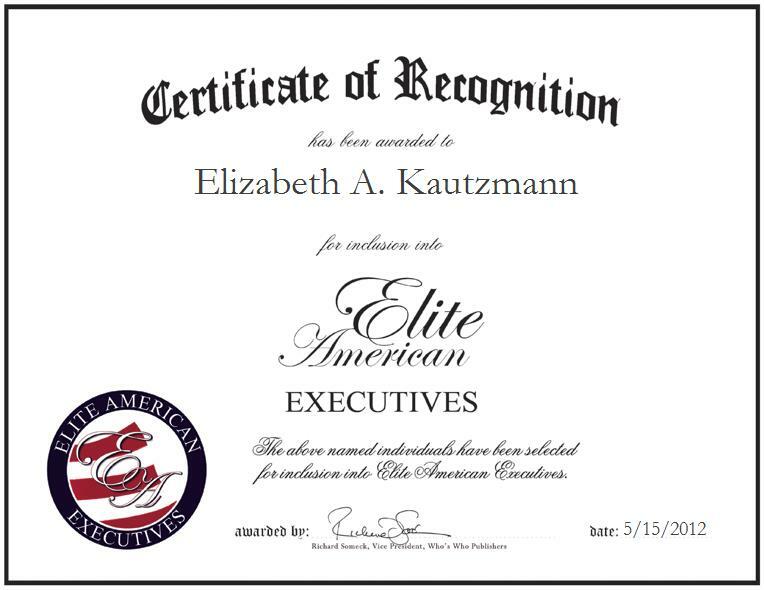 MASON, OH, May 15, 2012, Elizabeth A. Kautzmann, Laser Product Manager for FANUC FA America, has been recognized by Elite American Executives for dedication, achievements, and leadership in product management. Ms. Kautzmann has amassed more than 26 years of professional experience, and in her current capacity, she shines as a luminary in her field by bringing forth an acute knowledge of her field to the factory automation company that she serves. Specializing in crossover training, structuring, and encouraging employees to produce great work, Ms. Kautzmann works on initiatives to foster and promote new CO-2 and alternative laser market developments. She handles laser-cutting projects, sources to the production manager, and conducts research on new market trends. The Certified Laser Safety Officer, as accredited through the Laser Institute of America, is in charge of developing applications in high-speed cutting, welding and cladding at a lower cost. Ms. Kautzmann also gives presentations on technology at the academic level, demonstrating the sharp and keen insight that she has developed over the years. She holds accreditation as a Certified Six Sigma Green Belt, and in addition to her endorsements and certifications, she remains abreast of trends and developments in her field as a member of several industry-related organizations. Ms. Kautzmann is the vice chairman of the Industrial Laser Council, the chairman of the Fabricators & Manufacturers Association, and a member of Women in Manufacturing. Ms. Kautzmann studied at the Cincinnati State Technical and Community College, earning an Associate of Science in Industrial Laboratory Care, an Associate of Science in Electronic Engineering, and an Associate of Science in Laser Optics. She became involved in her profession while watching her father work on lasers; at the age of nine, she built her first laser. In her spare time, she takes pleasure in restoring old cars, and caring for her three boys.